Given a circle of radius r rolling around the outside of larger circle of radius R where R = 4r. How many revolution with the small circle make in rolling around the large circle one time? Give a mathematical explanation of your answer. Click HERE for a GSP file to simulate the rolling movement. Generalize. What if R = nr? How many revolutions of the small circle? 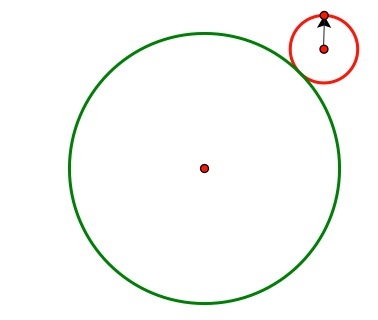 How many revolutions of the small circle if it rolls around the INSIDE of the large circle? Build a GSP sketch to illustrate rolling a small circle around the inside of a larger circle.